I have never thought before that there will be 8 bedroom villa at Seminyak – Bali. I mean, we are usually knowing about the 1, 2 and 3 bedrooms accommodation, but this? I am truly surprised at first thinking about how big this villa will be and how crowded to be inside since there will be more people are able to stay in. But that’s the true. One of the villa management in Bali called as the Hu’u Villas Bali is providing the travelers an 8 bedroom villa located in the heart of Seminyak or Petitenget. Another one surprise that I have never expected before is that, travelers are also possible to rent a villa up to 13 bedrooms because it has been built with a interconnecting design. Feel free to read more references about what the building concept is. 8 bedroom villa Seminyak will be great for the group of travelers who are traveling in Bali and requiring to stay at around the beach. That’s what the first two things you will get when decided to rent it one day. As the village that is closer to the beach, even the Seminyak square itself is just 5 minutes to the shoreline. And the 8 bedroom villa itself is getting closer to the beach than that. Imagine if you are traveling in Bali with your friends, many of them and stay in this villa and you are able to go to the beach anytime within walking distance–don’t you think that will be a great moment to share together? Seminyak beach that has been popular for years as place to enjoy the relaxing day in Bali while sunbathing, swimming, and even the surf culture for beginners is a tempting place to experience the best of the journey. Many others were even getting their romantic diners at the beach where that can also be a thing you can do as a falling in love couple. 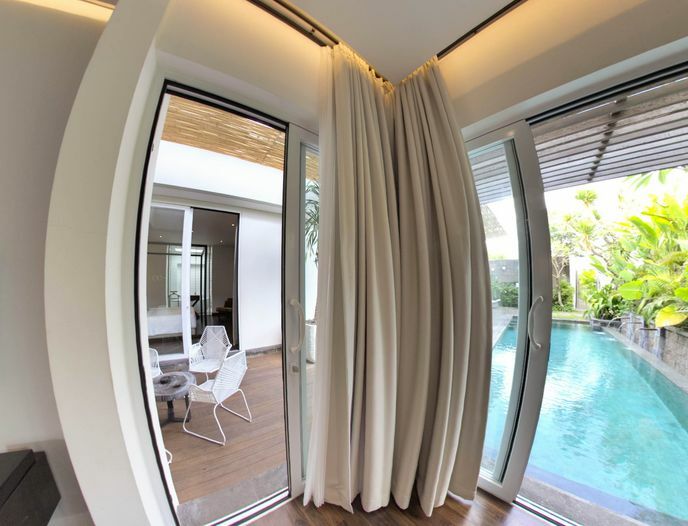 Staying in 8 bedroom villa at Seminyak can also be recommended for company’s outing. It can be great as place to stay while the big space of the building can also be used for many activities. Having a party in the villa? That won’t be an issue anymore. Even the villa management has been actually providing the guests to enjoy themselves at the bar called as The Den. It’s villa facility, you can spend your time there as well. Even though this “so many bedrooms” villa will be able for those travelers in a group, as it is build in respecting your privacy, all of the travelers will still get the personalized experience. At least, public is restricted ever since its location is secretly hidden at the area. By the dedicated staff that have been provided to be ready to serve you, all of your need can be easily fulfilled. You can even ask them to bring the foods to the 8 bedroom villa from the nearby restaurant or simply ask their help to find you a motor bike rental. Keep on remember, if you are in Bali with your friends, so many friends or colleagues, you can think about spending the luxury living in this 8 bedroom villa at Seminyak.